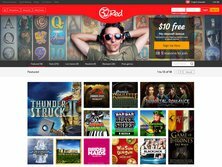 32Red Casino wants the player to experience the thrill of playing in an online casino. In order to provide suitable entertainment, the casino has focused on delivering super high-quality games with the help of Microgaming, a well-known internet gaming software provider. The games can be played instantly in the browser. As a result, the player has a realistic chance of winning while being entertained in the process. The best thing is that the casino has a policy of fast payouts, which ensures that the player does not have to wait endlessly for the money that has been won. The new players get a very nice welcome bonus offer, mainly $32 for every $20 deposited at the casino up to $160. The welcome bonus is only available to new players and is subject to wagering requirements, so see full terms and conditions for details. New players can alternatively claim a $10 no deposit bonus. This promotion is subject to 50x wagering requirements and can only be claimed by first-time players. The maximum withdrawal amount for this promotion is $100. The casino's full terms and conditions apply and no persons under the age of 18 will be allowed to partake in the aforementioned bonuses. The dish of the day bonuses are another great opportunity to pick up a lucrative 32Red Casino Bonus and get extra gameplay! In order to fully participate in the offer, the player must login to the download or instant play casino and opt-in for the dish of the day bonus. When a deposit is made at the venue, the bonus is automatically awarded. There is also a special promotion which is associated with the Mega Moolah. It allows the members to earn loyalty points and have a shot at becoming a millionaire. The 32Red Casino is known for its daily slots tournaments. It provides $250 in freerolls on a daily basis. This deal is available in the download-based casino. The club rouge provides even larger bonuses for high rollers who stay at the site. Lately, the casino has added a red letter day promotion in which 1000 free chips are given out. The casino has many British associations. The casino is part of the 32Red PLC, which is a British company. This company is based in the British Overseas Territory, mainly Gibraltar. The casino has gained much attention since the company has been listed by the London Stock Exchange. Many British players have flocked to the place. However, the players from other parts of Europe are also strongly represented here. The Bridesmaids Video Slot has been featured on the main page. It also happens to be one of the games that has really caught the attention of players. Mega Moolah is another such game. It is available in the free play version. It's helpful to mention that these free play versions are available for many of the games on the site. In terms of the rest of the popular game offer, it may also be helpful to list a few of the titles; The Legend of Olympus, Kitty Cabana. Penguin Splash, Ariana, Big Chef, Rabbit In The Hat, Terminator 2, Golden Princess, Castle Builder, Football Star, The Dark Knight Rises, European Roulette Gold, Retro Reels, Immortal Romance, Cashapillar, Doctor Love, Lucky Witch, Alaskan Fishing, Thunderstruck, Gold Factory, Asian Beauty, Tomb Raider, and a whole lot more! Being a long-running online casino, the website inspires confidence. Of course, it is still possible to encounter some unresolved complaints. However, it is rather hard to see whether the complaints are valid, at least from a reviewer's perspective. Many people say that they have only had a good experience with the casino. The reviewer can pretty much say the same thing. There are no major red flags here. This casino has been around for awhile. It' been operating since 2002. For online casinos, it is an achievement, especially when one considers how many places have sunk. The current license comes from the Government of Gibraltar. I appreciate the fact that the casino has been able to keep up with the latest casino trends with such a long history. I felt like I was able to find all the games that would normally keep me glued to the computer screen. I was especially happy to see the Bridesmaids Video Slot on here. I also thought that the welcome bonus deal was unique in that it was arranged rather differently than what I've come to expect. The free chips are another big plus. In fact, I was deeply impressed by the wide variety of promotions on the website. It seemed like there was no end to them. This is especially true for loyal players who can receive all kids of extra rewards.